Researchers, led by Dr David Ferrier of The Scottish Oceans Institute at the University of St Andrews, found that some modern-day animals like sponges, comb jellies and placozoans (a flat, splodge of an animal with no head, tail, gut or limbs) may have actually evolved by losing some genes and perhaps became simplified from a more complex ancestor, from which the entire animal kingdom evolved. Dr Ferrier and his team studied key genes, known as Hox and ParaHox, which are renowned for building the bodies of nearly all modern-day animals. They control where ribs develop in humans or where wings develop in flies, and can be disrupted in diseases such as cancer and diabetes. Until this latest research, scientists had argued over whether these genes evolved in a step-wise fashion, during early animal evolution, or instead were present in the very first animals. Dr Ferrier explained, "The conventionally accepted view was that these genes were interlinked with the increasing complexity of animals as the earliest animal ancestors were succeeded by more advanced creatures, with a greater diversity of different cell types and a greater range of genes that build this gradual increase in complexity." By comparing the genomes of animals like humans and sea anemones, the St Andrews' researchers could reconstruct the 'neighbourhoods' that surrounded the Hox and ParaHox genes in the ancestor of these animals, even though this ancestor lived (and died) more than 550 million years ago. 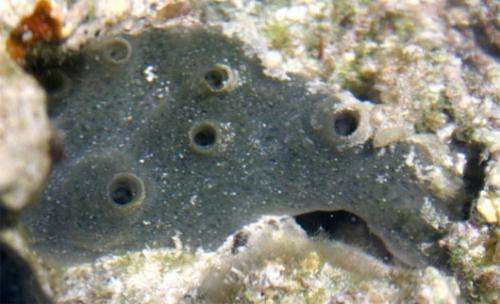 These researchers found that some animals, like sponges and placozoans, which evolved earlier than sea anemones and humans, still have these neighbourhoods, even though they do not actually contain the Hox and ParaHox genes themselves. Dr Ferrier continued, "These neighbourhoods are like ghosts in these genomes, providing a faint representation of what existed previously, with the Hox and ParaHox genes having died and disappeared, but leaving a ghostly outline behind. "Our work provides a completely different view to the consensus that had developed over recent years about the very first animal ancestor. "This new approach, which reveals the ancient origin of these important developmental control genes, means the hunt for these genes in early animal lineages is now back on." Is the first real evidence? As I've already heard this can happen in theory. Nothing new here. Reduced complexity via evolution is everywhere from hooves, to mitochondria. The only people who don't know that evolution is an all way street are those who don't have a clue to what evolution is. Apparently that means most people. Evolution is simply a change in allele frequency in breeding populations. That's it. If allele frequency changes, evolution has occurred. ANY change; more complex, less complex, more alleles, less alleles... it's all evolution. You're right, most people don't understand what evolution is. Probably because they've been told so often that it's one strawman or another. It's baffling in a way because at the core of it, the definition is pretty simple, and doesn't imply a vector at all. What this research shows is what we already know: Nature, or evolution in this case, is always so much more than the ideas we have about it. There's been ample evidence for quite some time that evolution, or adaptation to the environment, can always take a step back into a former solution. However, as Heraclitus said, one cannot step into the same river twice. Even though certain genes were deleted in an apparent return to a former state, their "environment" (which I surmise is the dumbed-down word the article uses for epigenetic factors) still remained. The organisms involved did not return to the genetic "clean-slate" of their "simpler" ancestors and thus were still, even if not functionally, more "complex." The article jumps the gun in declaring an end to the idea of complexity in evolution. What I find fascinating, though, is that evolution may have retained a "place-holder" of sorts for the deleted genes. No you are not including natural selection. Change only persists if it benefits an organism. Change only persists if it benefits an organism. Not true. Change only persists if it does not hinder reproduction. All sorts of neutral changes persist. IMHO, without the build-up and combination of neutral changes many truly beneficial evolutionary steps would not be possible, or at least be much more unlikely. It depends, how we define the complexity. What we are calling complex and "advanced" is actually just a result of specialization, not evolutionary advantage. The "complex" organisms are adopted for living in complex ecosystem, not for living in harsh conditions. The ecosystem composed of complex organisms is actually quite brittle, when it suffers with some global catastrophe. For example the lancelets may appear like primitive animals from macroscopic perspective, but their genome isn't shorter than the genome of mammals. They exhibit impressive immune system and metabolic apparatus, which enables them to digest whatever bacterial food, they will find in their neighborhood. They simply evolved to eat everything, so they're not specialized and they may appear primitive macroscopically - but they're very complex microscopically. Evolution is simply a change in allele frequency in breeding populations. That's it. Very interesting science behind the overblown and dull press release. The metazoan LUCA was a complex generalist (had the Natural Killer Complex for immune defense, but also Hox and ParaHox for a body plane). Reminds on how the DNA LUCA had a complex dual carbon uptake metabolism and non-chiral mixed membranes before the domain split into Archaea, Bacteria and Eukaryotes according to similar phylogenetic work. There are many ways to fix allele changes in a population. Near neutral drift can fix alleles those fitness is near neutral by random chance, if other alleles go extinct for no other reason than coincidence. And you are trivially wrong on selection. Both natural and artificial selection fix positive and negative relative fitness, in the first case generating new traits and in the latter case weeding inferior traits. And absolute fitness only requires population survival, see drift. Mind that these fitnesses, absolute and relative, are relative the environment. Do you think pug-nose dogs benefit the organism as such, when their eyes fall out of the sockets regularly? Only when they will be retained as pets. The core of population genetics, the math behind evolution, is simply frequency of alleles. Complexity and genome sizes doesn't come into basics of the theory, the first is fuzzy since it admits many definitions and isn't relevant for the main theory, the latter lacks a theory and again is describing observations that is not relevant for the main theory. "Gould argued that evolution's drive was not towards complexity, but towards diversification. Because life is constrained to begin with a simple starting point, any diversity resulting from this left wall will be perceived to move in the direction of higher complexity. But life, Gould argued, can easily adapt towards simplification, as is often the case with parasites." As you can see, Dawkins disagree and makes a good case for cumulative progress. This is partly a deep conflict between science programs of adaptationists vs drifters. And no, a prediction from one theory doesn't support another theory. That is a false choice proposal. In this case, the prediction is still good by the way since the area is open. We would have to compare robustness of cumulative gene diversity with having none, and find out how different kinds of complexity benefits that. A tall order. More pertinently, creationism isn't a theory and not even wrong because it has no mechanism, but an anti-science idea out of religion. There really is no value in mentioning religion on science blogs, myths are not useful for science but a hindrance for understanding. Good point. There is no correlation between genome size and Dawkins' cumulative complexity. Archaea are low energy specialists and tend to minimize their genome size , while Bacteria are medium energy generalists (Valentine's energy theory) and have consistent with that roughly retained the LUCA genome size according to phylogenetics. Eukaryotes are high energy photosyntesists/heterotrophs and have been able to vastly increase the genome size by having ~ 10^5 higher energy density from the mitochondrion endosymbiosis event (Lane's energy theory). So we have 2 main periods of genome size. First a roughly linear increase between the RNA world over the RNA/protein world throughout the DNA LUCA reign. Then the diversification where genomes ended up with 3 regions of genome sizes, which then were kept. There is no general theory predicting genome sizes as I already have mentioned. In the latter period, Gregory's "onion test" could perhaps suffice to predict stasis - eukaryote and especially plant genomes can multiply by polyploidy yet the species looks much the same. In the first period a stately progress could perhaps be predicted by Dawkins' cumulative complexity. The LUCA was much more regulatory capable than the first protocells by way of enzymes, a cumulative complexity indeed and likely benefiting the organism to boot. If nothing else the protocells were likely confined to the temperate environment of hydrothermal vents and had to acquire RNA replication within ~ 0.1 million years to convert to free floaters. [cont] When protein synthesis evolved, likely as a means to assist melting longer RNA duplex chains before replication by way of the simplest possible unidirectional brownian ratchet - the bare protein making ribozyme - proteins that assisted metabolism by first simply being non-poisonous and later reused as amino acids were selected for. This is the simplest darwinian (small step survivable) pathway predicting the evolution of the genetic code. This assisted free living by starting to increase the habitable zone around vents, first by not necessarily needing them as organics supply but later as replacing the local redox energy sources with scavenging from other environments. So evolution of regulatory complexity and habitat expansion went hand in hand. Maybe Dawkins has a point after all, his hypothesis seems pertinent and visible for the young anoxic biosphere. For today's biopshere, it seems difficult to ascertain and no longer relevant for genome size hypotheses. I don't know where they get this from. Complexity isn't the hallmark of evolution. Adaptation to an environment is. If your environment changes to become less dynamic (e.g. because suddenly predators die out, or you make the jump from a highly volatile to more temperate region) then that will favor more simply adapted specimens. A simple example of this is acne. Take an acne cream. This will kill off the simple bacteria on your skin, leaving more complex ones (those with thicker membranes) behind. Stop taking the cream and the simpler ones will resettle and outbreed the more complex ones (since they require more energy to produce thick memnranes which the others can pump into reproduction). Although it can be said that there are more ways to damage more complex mechanisms. Battleships are arguably complex but have 'evolved' many complex defenses in response to anticipated threats. They are thus relatively hard to damage. OK, "acne cream" is a dull nerdy metaphor - try to imagine, which animals or plants would survive the nuclear war and/or meteorite impact. These complex, specialized ones will be first to decline, only these evolutionary old, widespread and tested with supernova explosions (like the cockroaches) will survive. After all, we are observing it by now with migration of invasive species during global warming. Battleships are so easily defeated by air power that they are not even being made anymore. The last US battleships, USS Wisconsin and USS Missouri, were decommissioned in 1991 and 1992, and finally stricken from the U.S. Naval Vessel Register in 2006 and 1995, respectively. "Research suggests that evolution sometimes meant becoming simpler, not more complex"
Obviously, just look at us, simpletons seem to be proliferating at an accelerating rate. I guess that means Fox is an example of evolution. simplification of the bauplan is not a surprise at all for the competent scientist, and the idea has been around for decades, if not a century and more..
As you so succinctly put it: claptrap. Having an extra system costs energy. That is unfavorable in an environment when the attacking agent is no longer present. Battleships are arguably complex but have 'evolved' many complex defenses in response to anticipated threats. Good example. Battleships became so hugely expensive as a result (and also so hugely vulnerable to many new weapons systems) that they were out-evolved by simpler desings with less (in numbers) complex offenses and defenses: the submarine, the aircraft, the missile and the mine. No you are not including natural selection. Such a definition doesn't explain, why the genomes grow in size during evolution. Definitions don't explain. That's what the theories are for. The simple definition of evolution is the one I stated. That allele frequency changes is a fact, and is called evolution. From that point on, the work begins. WHY does allele frequency change? How? That's where the many theories come into play. Natural selection, gene drift, selective mating, viral insertion, etc. etc. These are all theories of evolution that attempt to explain the fact of evolution, i.e. change in allele frequency. Note that there isn't just one explanation that is/would be correct. Many mechanisms can and do come into play. You want simplicity? The definition is pretty simple. The hows and whys are hard, though, and require a lot more work than trying to just poke holes in strawmen and calling it a day. Uh no they were superseded by the aircraft carrier, arguably the most complex machine currently built, and more expensive still than the battleship. Carrier groups quickly became vulnerable to nuclear weapons but it can be argued that the infrastructure needed to produce those weapons is a great deal more complex.